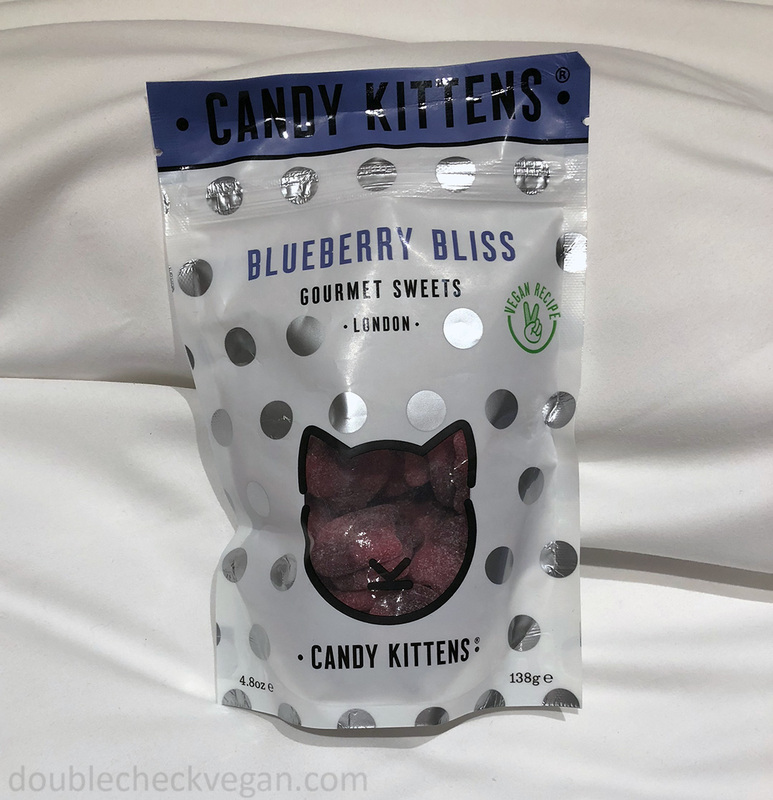 This summer, I stumbled on a bag of Blueberry Bliss Candy Kittens at a convenience store in London. The cute name and good graphic design caught my attention, so I was excited to see the words “Vegan Recipe” on the bag. I said to my husband, “We have to get these, right?” He agreed. Peach Fuzz Candy Kittens we ordered once we got home. Even better than the Candy Kittens packaging was the taste. We enjoyed them so much that when we got back home, he ordered all the vegan flavors and I was able to try them in a less frenzied manner. Candy Kittens is not an entirely vegan company but over the past few years it has updated most of its gummy candy recipes to be vegan. There are currently four vegan gummy candy flavors: Peach Fizz, Blueberry Bliss, Wild Strawberry, and Sour Watermelon. Eton Mess, the only non-vegan flavor is instead vegetarian because it uses beeswax as a glazing agent. Perhaps the company will someday switch to carnauba wax. Of the four vegan Candy Kittens flavors, Peach Fizz is my favorite. It reminds me of the sour gummy peaches you find in bulk bins or the ones made by Haribo. But the Candy Kittens Peach Fizz tastes more like a real peach than the others. This makes sense since this Candy Kittens flavor contains 6% peach juice from concentrate. Meanwhile, Haribo contains “artificial and natural flavors” – no indication of real peach. I had this thought when eating Peach Fizz: The combination of the sour sugar’s rough texture and the intense peach flavor really invokes the sensation of touching one’s tongue to a peach’s fuzz while inhaling the aroma of the fresh fruit. The other vegan flavors also contain real fruit juice concentrates. Blueberry Bliss has 10% blueberry juice from concentrate, Sour Watermelon has 10% watermelon juice from concentrate, and Wild Strawberry has 6% strawberry juice from concentrate. My husband’s favorite is Blueberry Bliss. They’re all really solid flavors with a nice chew, it just depends on your flavor preference. Our first bag of Candy Kittens. Candy Kittens was founded by Jaime Laing, a longtime cast member of British reality TV show, “Made in Chelsea.” Laing is also the great great grandson of Alexander Grant, inventor of the Digestive Biscuit. I had never heard of that TV show or a digestive biscuit until researching Candy Kittens this week. Anyway, celebrities aside, I highly recommend Candy Kittens. They also just started taking pre-orders for a vegan gummy advent calendar. BUT, before you go eating a whole bag at once, please read my rant about added sugar and check the nutrition information for how many to eat. And, if you’re a fan of vegan gummy candy in general, check out my often updated list of vegan gummy bears. Watch out for still-circulating bags of Candy Kittens from before they changed to vegan formulas. These are still floating around on Amazon. 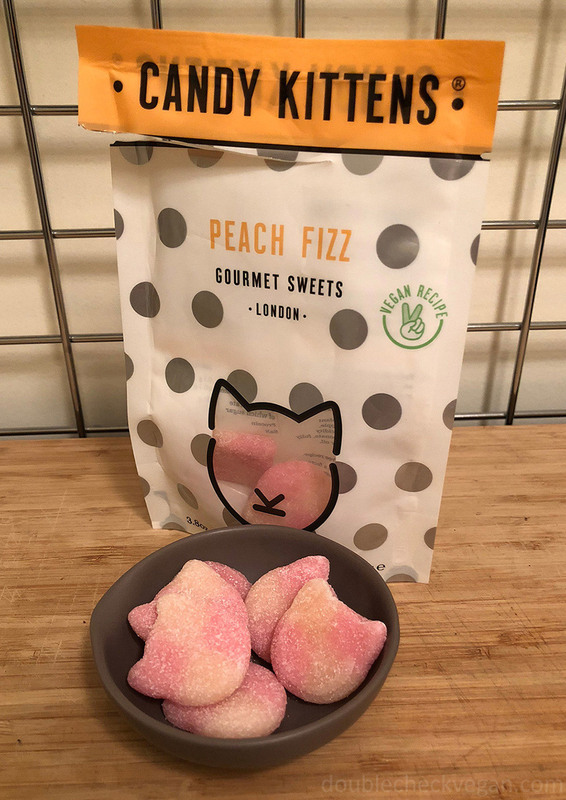 For now you can find vegan Candy Kittens on the official Candy Kitten website and some of the flavors at Brit Super Store. This post does NOT contain affiliate links. I just really like this candy.